Let's face facts here: most people move from one rental to another. Owning a house is everybody's dream (part of the American dream), but not fulfilled by everyone. That's another painful story, but not our subject here. As a matter of fact, many people prefer to live in rentals than being in debt for the rest of their lives (who has the cash to get a house without a mortgage?) In fact, they are so happy they fail to check all parts of the house. With 9 out of 10 people searching homes with a garage, most people get to rent a house with a garage door. The question is: did you check it before renting the place? 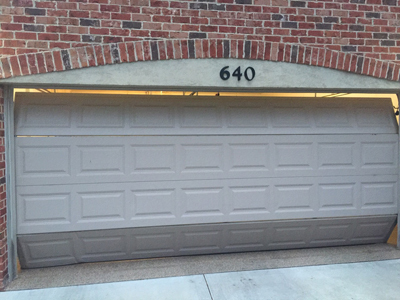 Garage Door Repair in River Edge encourages people to upgrade their door and the whole system as a way of getting an added value for their home. How many do they actually do that? When owners are about to sell or rent their home, the last thing they do is spending money on the old house. The point is that you (as a tenant) might end up with an overhead door not moving exactly the way you were expecting it to. Don't be dazzled by the color or the beautiful tiny windows. The door might look good, but does it work to your expectations? Will opening and closing the door a couple of times allow you to understand its condition? Well, it will give you an idea but you must take a closer look. Ask to see receipts about the last time the system was maintained. At least you will know when it was last checked. You have nothing to lose asking about its condition, whether garage door repairs are in order and what the weak points of this specific system are! Insist on asking about the opener and the safety features. Since it's easy to test the reverse system, test it right there. Make sure the door goes all the way up, closes well on the ground and doesn't make weird noises. If you decide to rent the place, garage door maintenance and repairs become your responsibilities. All the good and bad things related to the door go with the house. So, it's critical for your safety to maintain the good things about it and fix the weak parts. It's just important to know about the pros and cons of the system beforehand to avoid surprises. Use common sense when renting the new house. Even if there are some problems with the door, don't let them change your mind about renting the house (you will never find the perfect one). Just keep balance among the positive and negative aspects and consider how much you will need to fix the garage door parts. If the rent is okay and the price for repairs is reasonable too, you are on the right track.